As reported by TMZ, Ann B. Davis died at her home in Texas on Saturday after falling in the bathroom and hitting her head. She was reportedly knocked out after suffering a subdural hematoma and never regained consciousness. She was 88. 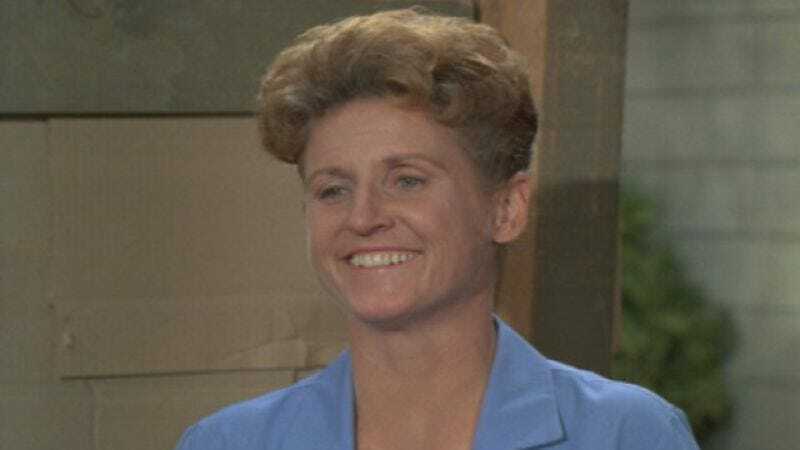 Though she first became known thanks to a recurring role on The Bob Cummings Show, Ann B. Davis was, of course, best recognized as Alice Nelson, the jovial housekeeper on The Brady Bunch. For five seasons and a handful of TV movies and spinoffs, Davis’ Alice looked over the wacky Brady family—and her longtime boyfriend, Sam the butcher—while providing them with her dry brand of self-deprecating humor. Davis played a trucker in a cameo appearance for the 1995 Brady Bunch Movie, but she didn’t take too many acting roles in the years following the show—at least as characters that weren’t Alice—other than showing up in an episode of the sitcom Something So Right in 1997. TMZ says that Davis’ death came as a “total shock” to her roommate, who believed her to be “pretty healthy for an 88-year-old woman.” At least she’ll live on in Brady Bunch re-runs that will presumably continue to air until the end of time.